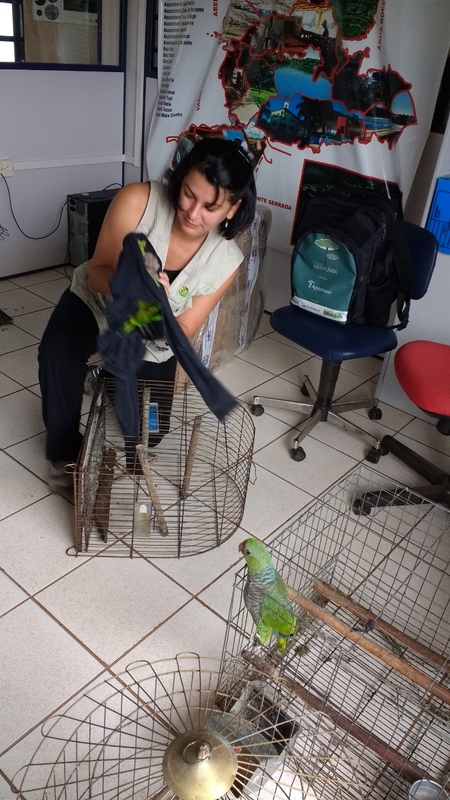 Brazilian conservationists have collected sixteen Vinaceous-breasted Amazons (Amazona vinacea) which were kept as pets in small villages around Araucaria National Park to release them back to the wild. This national park is a place where the Vinaceous-breasted Amazon was found in the past. Since 2010, researchers have been trying to reintroduce it here. Private owners who kept this species in the region followed the request of conservationists from (ICMBio) to return all specimens, which are in illegal possession, to the state. These birds will be, after appropriate quarantine process, added to the group of individuals which is being prepared for release to the wild in national park Araucaria. The obtained birds come from people in Paraná, Santa Catarina and from surrounding villages. „Public campaign was aimed at quite a lot of people. Many of them called us and decided to hand their birds in,“ said the project administrator Juliano Rodrigues Oliveira at the official ICMBio website. „At this moment, these parrots have a chance to live with others of their kind, to receive the right food and appropriate care. We know that many people have animals which are wild caught, there is no doubt that they love them and acquired them with good intention. However, regarding their welfare it is better to keep them in a specialized breeding center or to release them back to the wild,“ he added. Authors of the campaign have emphasized that any person which is going to hand a parrot in will not be prosecuted for illegal possession. „This action had two main aims. Beside the fact that welfare of obtained animals was improved, another priority was to reduce total number of illegally kept birds, especially in regions which are close to national park Araucaria,“ said Juliano Rodrigues Oliveira. Apart from the sixteen birds, authorities have also received information about other individuals which are kept illegally. An intensive process of habit breaking is ahead. Birds need to loose their tameness and at the same time they have to be prepared for the wild life. This process will probably take a couple of months. Since 2010, when the project of Vinaceous-breasted Amazon release in Araucaria national park began, 83 individuals have been released. Before that, any birds of this species have not been found here for 20 years. Today, the total population counts around 2500 individuals. Birds of this species occur in Brazil, Argentina and Paraquay. According to IUCN Red List, they are classified as endangered.